We’d love your help. 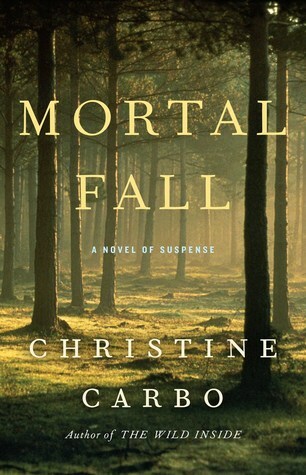 Let us know what’s wrong with this preview of Mortal Fall by Christine Carbo. Glacier National Park police officer Monty Harris knows that each summer at least one person—be it a reckless, arrogant climber or a distracted hiker—will meet tragedy in t A wildlife biologist’s shocking death leads to chilling discoveries about a home for troubled teens in Christine Carbo’s haunting and compelling new crime novel set in the wilds of Glacier National Park. To ask other readers questions about Mortal Fall, please sign up. I received a copy of Mortal Fall: A Novel of Suspense from NetGalley for an honest review. I wish to thank NetGalley, Atria Books, and Christine Carbo for the opportunity. This is certainly not my first rodeo with the author, Christine Carbo. I have read her outstanding book, The Wild Inside, as well. (See my review on Goodreads.) You don't have to be the "outdoorsy" type to enjoy the eloquence of her writing skills. She has the fine-tuned talent to take you on the serrated edge of this towering I received a copy of Mortal Fall: A Novel of Suspense from NetGalley for an honest review. I wish to thank NetGalley, Atria Books, and Christine Carbo for the opportunity. This is certainly not my first rodeo with the author, Christine Carbo. I have read her outstanding book, The Wild Inside, as well. (See my review on Goodreads.) You don't have to be the "outdoorsy" type to enjoy the eloquence of her writing skills. She has the fine-tuned talent to take you on the serrated edge of this towering cliff with precarious results. Monty Harris is a game warden and an investigative officer in the Glacier National Park in northwest Montana. He comes across the body of Paul "Wolfie" Sedgewick, a wildlife biologist, who has been following the transmitters attached to wolverines in the area. Was this an accidental fall in the line of duty or is there more burrowing below the leafy forest floor here? When another body is found beneath the high cliff precipice in the same general area, Monty digs in deeper and makes some dangerous enemies along the way. Now here is where Christine Carbo shines. Her uncanny ability to portray the raw-boned elements of her characters is especially noteworthy. How they shadow dance within the corridors of this storyline adds to its multi-faceted draw. There's more to just a murder investigation here. Carbo adds a dash of controversy with the impact of biological studies on land protection and how it affects the local communities. And Monty must come face to face with his own demons....those from within and those from without. We come to know a man haunted by his past and Carbo reveals his anguish layer upon layer as only she can. I'm a dedicated fan of this author and look forward to her next offering which can't get here fast enough. 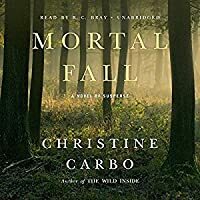 On the heels of her excellent debut novel, The Wild Inside, Christine Carbo returns with another suspense-filled book, Mortal Fall, which also takes place in and around the majestic setting of northwestern Montana’s Glacier National Park. The protagonist is a park police officer named Monty Harris who somehow survived an extremely dysfunctional family life as a child to graduate college and become a productive citizen. But he’s haunted by specters from the past which continue to affect his curre On the heels of her excellent debut novel, The Wild Inside, Christine Carbo returns with another suspense-filled book, Mortal Fall, which also takes place in and around the majestic setting of northwestern Montana’s Glacier National Park. The protagonist is a park police officer named Monty Harris who somehow survived an extremely dysfunctional family life as a child to graduate college and become a productive citizen. But he’s haunted by specters from the past which continue to affect his current life, both personally and professionally. He’s now separated from his wife, Lara, due in large part to issues springing from his childhood, and his work is now basically his life. He strives to do the best he possibly can, focusing on the job almost exclusively. As the book opens, Monty is called to a scene off the park’s main highway, Going-to-the-Sun Road, where a body has been discovered at the bottom of a deep ravine below a very popular hiking trail. The victim is a wildlife biologist named Paul “Wolfie” Sedgewick who was studying the wolverine population in and around the park. It’s possible that Sedgewick fell accidentally, as hikers sometimes do in a moment of carelessness. But Monty has trouble imagining such a thing. Sedgewick was no ill-prepared tourist from the flatlands; he was an experienced mountain hiker and the fact that he could have fallen seems incomprehensible. It’s possible that Sedgewick might have committed suicide, but did he have a plausible reason for doing so? As for other alternatives, as one of the characters observes, the most fool-proof way to murder someone would be to push them off a mountain cliff when no one else is looking. But who might have wanted Sedgewick dead? Harris has no evidence at all to suggest that Sedgewick’s death might be either a suicide or a homicide and, if the latter, he also has no plausible suspects, at least initially. But then, when Monty discovers portions of another body near the site where Sedgewick died, it appears to be too much of a coincidence, even though it very well might be. Hikers are anxious to have this business laid to rest so that the trail can be reopened. It’s clear that Monty’s boss would prefer that Harris rule these deaths accidental, so that things can get back to normal and so that the tourists won’t be scared away by concerns of a killer roaming the park. But Harris doggedly pursues his investigation while at the same time he deals with complicated family issues. The deeper he digs, the more sinister these deaths appear and before long, Harris may be in serious danger himself. Monty Harris is a deeply conflicted and multi-layered protagonist, and one of the pleasures of reading the story lies in watching the way Carbo develops him and the other characters. This is almost as much a character study as it is a crime novel. As in her first book, Carbo writes beautifully about the awesome physical setting in which this story plays out. At the same time, though, she captures the dark undercurrent of the environment around the park where significant numbers of people have no use for environmentalists, for the park service, the park police, or the government generally. The suspense builds from the opening pages and pays off with a great climax that few readers will see coming. This is another sure winner. Paul Sedgewick, a biologist and lead researcher of the Wolverine Research Team, has been found dead at the bottom of a ravine off the cliff edge of a well known hiking trail called the Loop in Glacier National Park in Montana. Then a second man is found dead at the bottom of the same ravine, off the edge of the same trail. Park police officer Monty Harris knows that these two men are both very experienced with the trails and terrain of the Park and both have superior climbing skills, not just in the summer, but in all weather conditions, including winter. So what really happened here? Monty begins to wonder if these are the result of two unfortunate accidents or something else entirely. As Monty digs deeper into investigating the two men's deaths, he comes face to face with his own personal demons and a connection between the two that he could never have imagined. The setting of Glacier National Park and murder. Two deaths from falling and they are similar. Now Park Police Officer Monty Harris has to investigate and one of these deaths is tied into Monty’s past. Great read and great detail about Glacier National Park. I would like to thank the Publisher and Net Galley for the chance to read this ARC. I wanted to like this book more than i actually did. It has a terrific setting, Glacier National Park, a sympathetic park police officer as a main character & a marvellous start with the unsolved disappearance of a child 22 yrs earlier. Unfortunately this tragedy has really nothing to do with solving the current mystery, the death of a researcher in Glacier Park, other than the main character Monty never got over the loss of his childhood friend and it has been weighing on his mind ever sinc I wanted to like this book more than i actually did. It has a terrific setting, Glacier National Park, a sympathetic park police officer as a main character & a marvellous start with the unsolved disappearance of a child 22 yrs earlier. Unfortunately this tragedy has really nothing to do with solving the current mystery, the death of a researcher in Glacier Park, other than the main character Monty never got over the loss of his childhood friend and it has been weighing on his mind ever since. That was part of the problem with this book for me. Monty spends too much time (chapters) obsessing about his separation from his wife, often ignoring her calls but still being drawn to & distracted by thoughts of her. He is also mentally crippled by his childhood which included a drunken father, mentally unstable mother & abusive older brother. His brother lives & works close by, yet they have had little contact as adults. I would have loved to have learned much more about Glacier National Park (other than repetitions of how beautiful it is) and wish that the focus had been more about that than Monty's personal problems. If you're the kind of reader who enjoys reading about the main character's personal life more than the mystery, then this book is for you! I read this mainly because it is set in Glacier National Park. Unfortunately, it became so painful to read that I skimmed the last third of it. Misused vocabulary -- people "mulling about," "remiss" instead of "amiss" -- tripped me up repeatedly. The narrator does impossible things: "I clenched and unclenched my fists the entire drive to his house," for instance, which I would think makes for some extremely awkward driving. And there is, seriously, a three page metaphor using seafaring to descri I read this mainly because it is set in Glacier National Park. Unfortunately, it became so painful to read that I skimmed the last third of it. Misused vocabulary -- people "mulling about," "remiss" instead of "amiss" -- tripped me up repeatedly. The narrator does impossible things: "I clenched and unclenched my fists the entire drive to his house," for instance, which I would think makes for some extremely awkward driving. And there is, seriously, a three page metaphor using seafaring to describe his marriage which ends with the hilarious simile "iceberg like beacon." In addition, although I know this is very picky of me, no one eats or drinks anything in this book that they haven't "grabbed." And at one point it is more or less stated that it would take more than 5 minutes for a man to eat a roast beef sandwich. Most men I know could do the job in 3 while playing a video game with the other hand. Christine Carbo is an excellent writer. She draws the reader into her characters’ world, making them see what they see, putting the reader into their fictional shoes. Her descriptions and insights are wonderful. That said, for a suspense novel, her writing is a little too good. By that I mean that perhaps it’s too literary. The wonderfully crafted sentences detract from the story’s momentum. Maybe I’m alone in this as a reader and a writer, but I feel there’s a huge distinction between sentences Christine Carbo is an excellent writer. She draws the reader into her characters’ world, making them see what they see, putting the reader into their fictional shoes. Her descriptions and insights are wonderful. That said, for a suspense novel, her writing is a little too good. By that I mean that perhaps it’s too literary. The wonderfully crafted sentences detract from the story’s momentum. Maybe I’m alone in this as a reader and a writer, but I feel there’s a huge distinction between sentences that leave you breathless due to beautifully crafted language and those that leave you breathless due to magnificently crafted suspense. It’s hard for the two to meet. Not impossible, but hard. The good news is that over the course of the hundreds of pages of a novel, there’s a time and a place for both. Reading is like breathing. When the tension mounts, the sentences, like our breathes, need to become shorter – quick, simple and easy, with nothing to take the reader out of the zone. Wordiness bogs the reader down, slowing their pace, their breathing, their heartbeat. It brings them back to reality, and who wants that? This second book in Christine Carbo's series of crime solving in the Glacier National Park makes a side character of the first book the lead character. Monty, more of a bureaucrat in the first book, is now the quite boring, sometimes surprisingly quick witted investigator of two deadly falls in the park. I was slowly fighting and skipping through it. I did like the crime story and how the investigation evolved, it just had way too much baggage in it - Monty's angst about his alcoholic dad, parano This second book in Christine Carbo's series of crime solving in the Glacier National Park makes a side character of the first book the lead character. Monty, more of a bureaucrat in the first book, is now the quite boring, sometimes surprisingly quick witted investigator of two deadly falls in the park. I'm pretty certain that this is going to become one of my favorite series. After just two books, it is well on its way! I love the Glacier National Park setting of Carbo's books. As a Montana resident, I really appreciate the familiar area and the authenticity. I'm already a big fan of the characters. Monty is great, and I enjoyed seeing him investigate the death of a wildlife biologist. This one had great characters, a compelling storyline, and a fantastic setting! This is the second of Carbo's books I have read, having started with the most recent. It is true to form with its love of nature and Montana and Glacier Park in particular. The mystery and the characters are pretty good. However, I am concerned about the fact that the central characters (a male here and a female in my prior read) are both so very emotionally conflicted, with faltering relationships. Once seemed a plot device but twice seems a trope. I'm really enjoying this series, set in the most beautiful place, my Glacier Park! Pretty cool to be able to picture exactly the setting. Thanks to Rani for introducing me to Christine Carbo! What I really appreciate about Carbo's books is the deep ache of connection with the land and all that lives on it, particularly in this savagely beautiful high mountain area. She describes it all so lovingly and fiercely. And along with the ache of connection with nature comes the ache and the yearning of complex, messy human relationships. The counterpoint works. On the one hand, the human characters turn to nature for solace when family and personal trauma and drama gets too much to handle. O What I really appreciate about Carbo's books is the deep ache of connection with the land and all that lives on it, particularly in this savagely beautiful high mountain area. She describes it all so lovingly and fiercely. And along with the ache of connection with nature comes the ache and the yearning of complex, messy human relationships. The counterpoint works. On the one hand, the human characters turn to nature for solace when family and personal trauma and drama gets too much to handle. On the other hand, this is also a story of humans struggling to conserve wild nature, to make space for it to thrive without too much human commercial encroachment. I loved the setting of Glacier National Park! It felt like I was there. I appreciate the fair description of MT and her citizens. The plot was engaging, but I found the narrator too cool and distant. I really enjoyed listening to this 2nd book in the Glacier Mystery series. Monty Harris is investing the death of wildlife biologist Paul "Wolfie" Sedgewick. He was found at the bottom of a cliff in Glacier National Park. Was it an accident? A suicide? Or a murder? As Monty investigates, he discovers that there were lots of political implications of the death. Wolfie's study of the wolverine's life in the park or outside it could have results that would anger the people who live near the park and who want to have the right to hunt or develop or otherwise use the lands. Monty Harris is investing the death of wildlife biologist Paul "Wolfie" Sedgewick. He was found at the bottom of a cliff in Glacier National Park. Was it an accident? A suicide? Or a murder? As Monty investigates, he discovers that there were lots of political implications of the death. Wolfie's study of the wolverine's life in the park or outside it could have results that would anger the people who live near the park and who want to have the right to hunt or develop or otherwise use the lands. Making wolverines a protected species would hinder their plans. Monty wants to solve the case for Wolfie's family and also for his own sense of order. Monty is an interesting character who grew up in a very dysfunctional home. His father was a functioning alcoholic; his mother suffered from paranoia and depressions; and his older brother was a bully with a violent temper who tortured Monty when he was a child. Now, his mother is dead in a car crash; his father is living with another woman; and Monty hasn't seen his brother for four years despite the fact that they both live in the same area. It seems to me that Monty has a lot of unresolved psychological issues that are manifesting in his obsessive need for order. He and his wife have been separated for ten months because of her recent desire to have children despite agreeing at the start of the marriage that they would remain childless. This lack of resolution of his marriage is also causing a lot of stress for Monty. The whole case ramps up when a second body is found near the first. Monty is now trying to connect the two victims and figure out who killed them. Monty's investigation takes him into his brother's past at Glacier Academy where he was sent when he began using drugs as a teen. The second victim was an abusive counselor at the school when Monty's brother was there. Last year, I read Christine Carbo's The Wild Inside (also set in Glacier National Park) and enjoyed it. Glacier National Park is a "1,583-sq.-mi. wilderness area in Montana's Rocky Mountains" and that is an awful lot of wilderness. Carbo obviously loves the area deeply, but it is just as obvious that she acknowledges and respects all the dangers it represents. Mortal Fall follows the investigation of Glacier National Park police officer Monty Harris, who is tasked with determining the cause of th Last year, I read Christine Carbo's The Wild Inside (also set in Glacier National Park) and enjoyed it. Glacier National Park is a "1,583-sq.-mi. wilderness area in Montana's Rocky Mountains" and that is an awful lot of wilderness. Carbo obviously loves the area deeply, but it is just as obvious that she acknowledges and respects all the dangers it represents. Mortal Fall follows the investigation of Glacier National Park police officer Monty Harris, who is tasked with determining the cause of the fall that led to the death of wildlife biologist Paul "Wolfie" Sedgewick. Sedgewick was an experienced climber, intimately familiar with the terrain and its dangers, and many are finding it difficult to believe he fell to his death. Anyone, however, can have an accident or misstep, and the fall could have been an accident. Sedgewick was well-liked and well-respected, but his study of the endangered wolverine population was not popular with some locals, especially poachers. Monty feels responsible for finding the truth--an accident, suicide, heart attack, or push. When another body is found beneath the cliff, Monty's investigation leads to other possibilities, including one that might involve his estranged brother and the questionable academy for troubled teens that his brother attended years ago. Monty Harris was a secondary character in The Wild Inside, but carries this novel. Other minor characters return, giving the novel a familiar feeling, and Carbo makes the most of both characters and setting. The park itself becomes a kind of amorphous character in its own right. Carbo does a fine job of presenting flawed, but intriguing individuals who struggle with their own pasts. I look forward to more from Christine Carbo. Police Procedural/Mystery. May 31, 2016. print version: 416 pages. I like these books about Glacier National Park by author Christine Carbo very much. Last year I read THE WILD INSIDE about grizzly bears at the park and really enjoyed it. This year it's MORTAL FALL and the animals du jour are wolverines. Park police officer Monty Harris is the main protagonist in this story. A seasoned biologist studying wolverines is found dead at the base of The Loop on Going-to-the-Sun Road, a road that bisects the park east to west. Lots of questions are raised because everyone finds it hard to believe that Wolfie, as experienced as he was, would fall at that spot. Then the questions really start because another body is found in almost the same spot. I liked Monty in this story - quiet, dedicated, exacting in his work - and he loves the Park he works for, yet he has hidden depths that he keeps undercover - most of the time. There are many pieces to this story - Glacier Academy for wayward youth (that Monty's brother Adam attended when he was a teenager), the disappearance of Monty's best friend when the boys were young teens, public outcry against the wolverine study, and a lot more, especially about dysfunctional families. I loved the many descriptions of Glacier National Park and I can tell the author really loves the Park. I did feel that the story could have been tightened up by quite a bit. There was a lot of repetition in the tale - and then I felt the ending was kind of rushed. But if you love the outdoors, mysteries, police procedurals - and stories of family dysfunction - I think you'll like MORTAL FALL a lot. After you read a Carbo book, you are not left with the I've-just-eaten-a-whole-bag-of-Doritos feeling that many fast-paced, and light murder mysteries evoke. Instead, you are left feeling the deep satisfaction of having had your life suspended for a time, while you were dropped into the gorgeous setting of Glacier Park, and given a private tour via Carbo's knowing, skilled, and insightful eye. In Carbo's books, you don't just get a gripping story of murder and investigation. You get some of the After you read a Carbo book, you are not left with the I've-just-eaten-a-whole-bag-of-Doritos feeling that many fast-paced, and light murder mysteries evoke. Instead, you are left feeling the deep satisfaction of having had your life suspended for a time, while you were dropped into the gorgeous setting of Glacier Park, and given a private tour via Carbo's knowing, skilled, and insightful eye. In Carbo's books, you don't just get a gripping story of murder and investigation. You get some of the most poetic and beautifully wrought prose you will ever read, with thoughtful insights into the human psyche that invariably enrich the story. Mortal Fall is ultimately about hope and love and forgiveness--of others, and of one's self. This is the story of Monty Harris, police officer for the Glacier National Park Police. He and his partner Ken have been called in to investigate what appears to be an accidental fall off a cliff. The higher ups want the case closed and declared an accident ASAP to get the park back open to tourist but another body is found at the bottom of the ravine: coincidence? Monty doesn't think so but he has no proof of foul play. Through his investigation issues from his past start to resurface including This is the story of Monty Harris, police officer for the Glacier National Park Police. He and his partner Ken have been called in to investigate what appears to be an accidental fall off a cliff. The higher ups want the case closed and declared an accident ASAP to get the park back open to tourist but another body is found at the bottom of the ravine: coincidence? Monty doesn't think so but he has no proof of foul play. Through his investigation issues from his past start to resurface including the disappearance of his childhood friend and the contentious relationship he has with his brother, Adam. Monty is also having problems in his personal life. This is the second book in a series featuring Glacier National Park police officer Monty Harris. Fresh off his last case aiding another officer in investigating a murder by grizzly bear, Monty finds himself in the lead exploring the cause behind two eerily similar deaths from falls. One of the victims is a well respected park biologist and the other has ties to Monty's past. As he digs deeper into the deaths, Monty finds himself confronted by demons long held in check and family secrets that ne This is the second book in a series featuring Glacier National Park police officer Monty Harris. Fresh off his last case aiding another officer in investigating a murder by grizzly bear, Monty finds himself in the lead exploring the cause behind two eerily similar deaths from falls. One of the victims is a well respected park biologist and the other has ties to Monty's past. As he digs deeper into the deaths, Monty finds himself confronted by demons long held in check and family secrets that need to be exposed. The resolution of this case will leave you wanting more from this character. The publisher has requested that reviews be held until on or very close to the publication date (May 31). My review to come then!